The Literature Life – Book reviews, from the desk (couch, bed, bathroom floor) of a recent literature graduate. Use Chrome? Love books? You should have Bookindy already. Come on, hurry up. So at the end of May I discovered (see: probably stumbled upon on Twitter and decided to claim it as my own discovery) something pretty awesome. It’s free, it’s going to help you, and it’s going to help your local independent book stores. (As long as you live in the UK – sorry!) Sounds great, right? Unfortunately, not everyone is aware of how horrible Amazon is. I’ll admit I still buy things from Amazon when I don’t have much other option (needing next day delivery, something I can’t find in person, etc. ), but refuse to buy my books from there – considering that most of my shopping is books, it’d be pretty terrible if I did. I’m not going to go into why Amazon is the devil, but you can find out for yourself here, here, and here (though that was a quick Google for links, I’m sure there are better articles out there about the issues at hand). 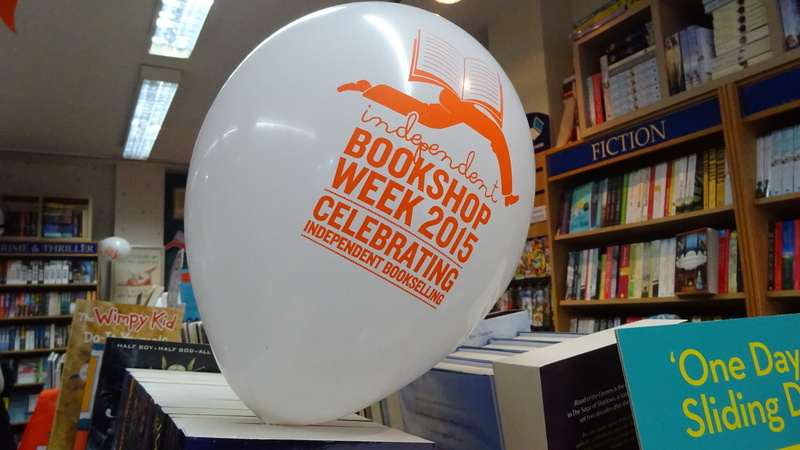 Not to mention… if we’re shopping on Amazon, we’re not supporting our local independent bookshops are we? 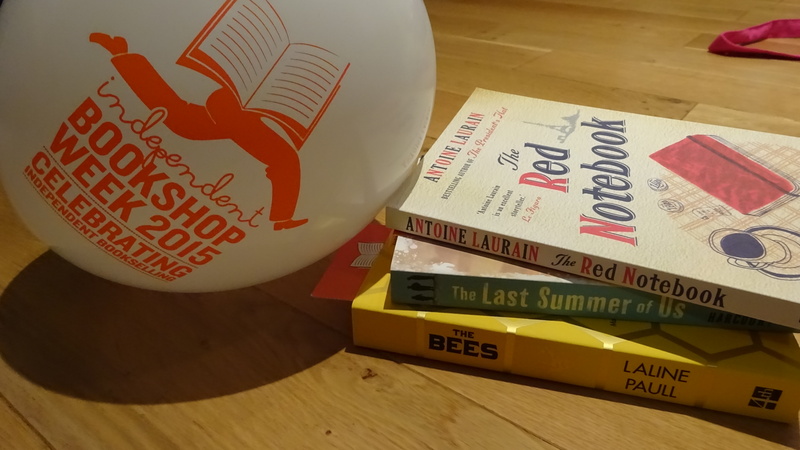 And there lies the biggest problem – shopping online may be convenient and quick, but bookshops are hubs of the bookish community, they’re there for you to discover new books in, and for booksellers to recommend their favourites to you. 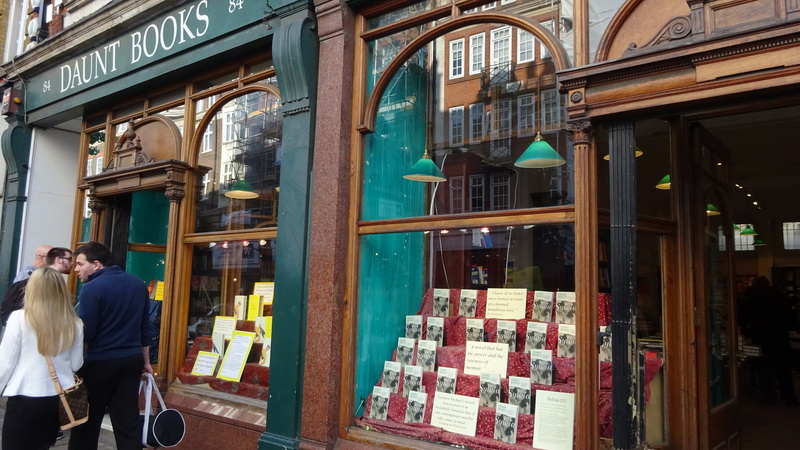 I love bookshops, most people I know love bookshops, even the ones who don’t read all that much. Bookshops are the best. Bookshops bookshops bookshops. So. How does all of this relate to each other? What’s this thing that can help? Well, let me tell you. Some wonderful people have now created a plug in/extension for Chrome which, whenever you browse Amazon for books, will remind you that you can buy it at your local independent bookshop. It’s called Bookindy and it is awesome. It will tell you how many miles away your local indie is, it will tell you how much the book will cost (sometimes it’s cheaper, sometimes it’s not), and help you buy it online if you can’t get to to the shop itself. It’ll even insert a little button right next to ‘hardcover’ and ‘paperback’ as another cheeky reminder that you could be doing something better for the publishing industry and independent bookshops than buying on Amazon! If you can’t make it to your local bookshop, for whatever reason, it will also give you a link to Hive, its partner. 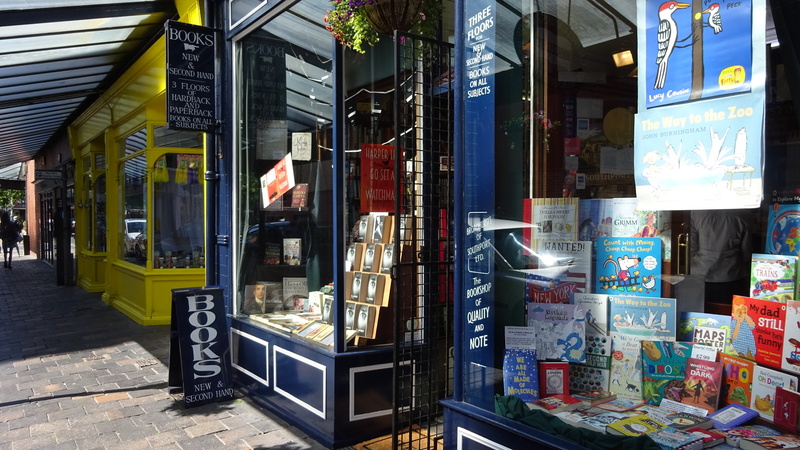 Hive is a website where you can shop for books online via your local bookshop, so that they’ll get a portion of the sale, while it will still get delivered straight to your front door. Great, right? With hive, every time you make a purchase you are supporting your local independent shop as well, just by continuing to do what you love – buying your books, eBooks, entertainment and stationery online. Happy days. 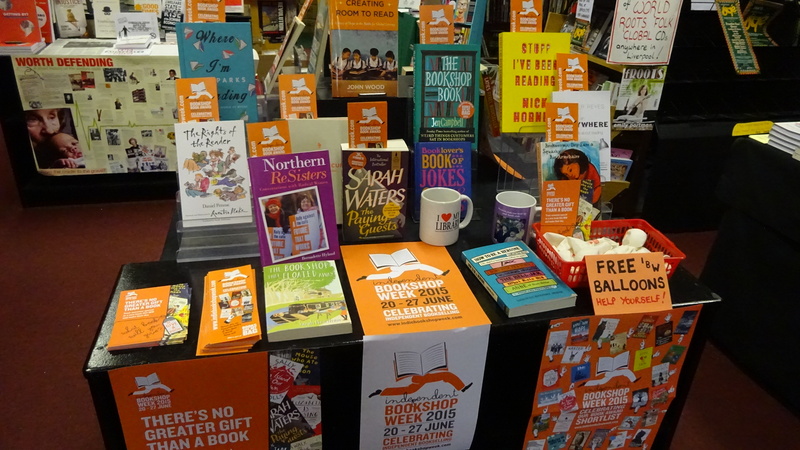 Hive have good deals on prices too, they work with over 360 local bookshops nationwide, and you can either have your order delivered to your bookshop or to your house, and I can’t think of anything more fantastic! You may have noticed that along with Amazon (grumble) and Book Depository, I also link to Hive on each of my reviews – and now you know why! 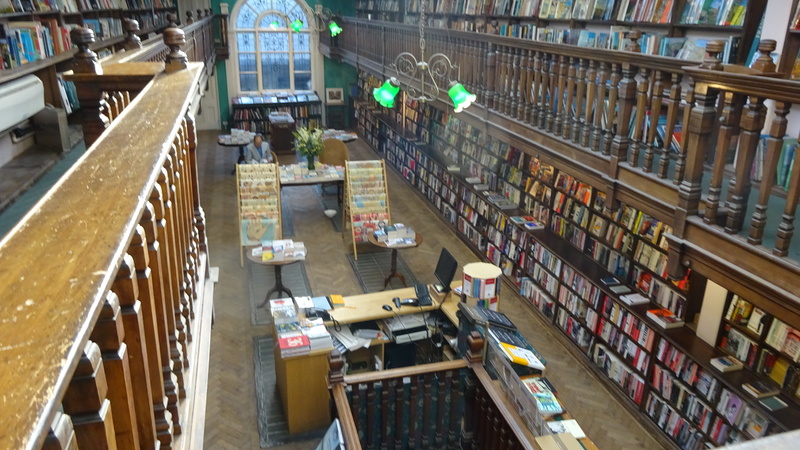 You do hear people banging on about how dangerous the internet has become for the publishing industry, and for physical books and bookshops, but we can see by this example that that doesn’t have to be the case – the internet can help you connect with your local bookshop if it’s otherwise not possible. Excellent. 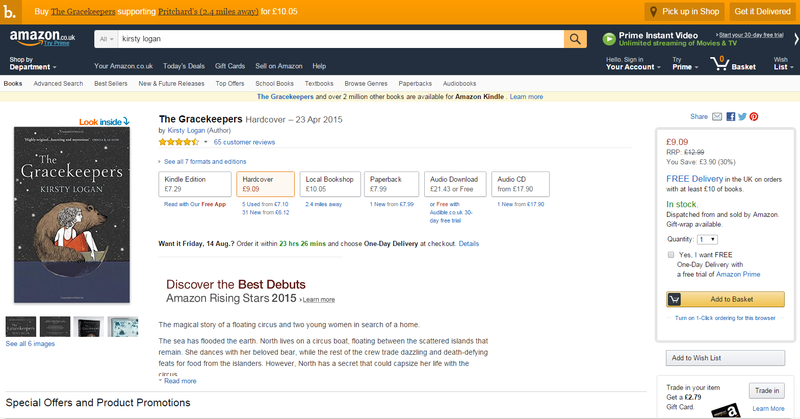 As far as I can tell, Hive is UK only, and so is Bookindy so that’s a bit of a setback – but it’s a start. Perhaps they can expand in the future, or other bookish folks overseas will pick up the idea. The new prices they advertise are also the prices offered through their own website, which – while still supporting local business, doesn’t take into account the RRP that indie stores will probably be offering. 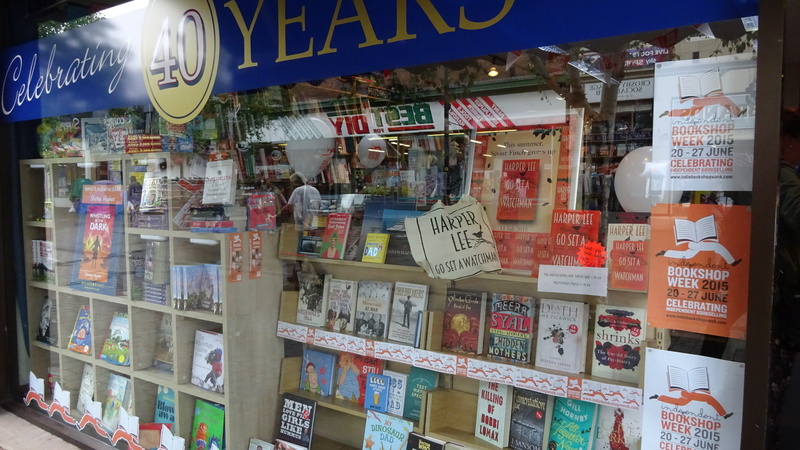 Nonetheless, I often find that many new and popular books in my local shop have money off and deals on, so it’s worth popping in to have a look, right? I’d be interested in seeing an addition to the app that will add a link to a Google Map giving you directions to your local bookshop, rather than just how many miles away it is. 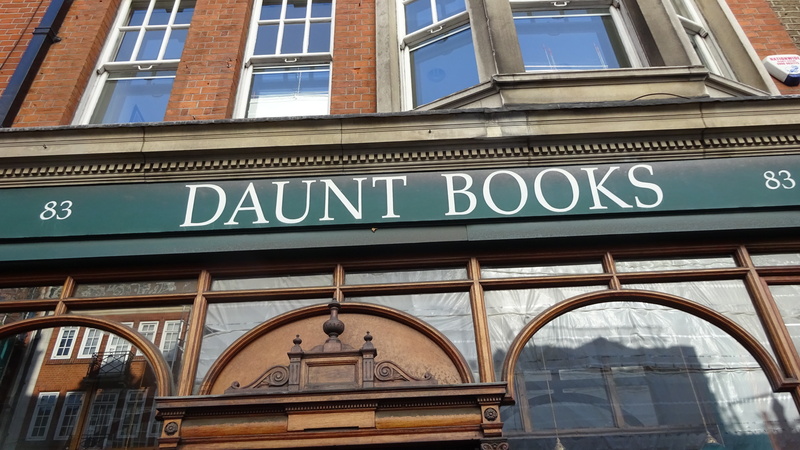 I can see that the idea is to drive people to buy from their website and bookshops simultaneously, and that may defeat the point a bit, but it would be a welcome feature. There you have it, I do think you should run along and install this free Chrome extension Bookindy, so that next time you happen to be scrolling through Amazon looking at all the lovely books you’d like to buy (we all do it), you won’t accidentally end up giving them your money, and can support indie bookstores instead! What can be said about The Gracekeepers that hasn’t already been said? Nothing much… Everyone already knows how beautiful it is, and has shouted it from the rooftops, so I’m finding it hard to put into words how much I think you should read this book… But I want to throw my two cents in! I’ll try, because I just want to share my love of it with anyone who will listen. Seriously. Keep on reading to find out why I loved this book so much. As a Gracekeeper, Callanish administers shoreside burials, laying the dead to their final resting place deep in the depths of the ocean. Alone on her island, she has exiled herself to a life of tending watery graves as penance for a long-ago mistake that still haunts her. Meanwhile, North works as a circus performer with the Excalibur, a floating troupe of acrobats, clowns, dancers, and trainers who sail from one archipelago to the next, entertaining in exchange for sustenance. In a world divided between those inhabiting the mainland (“landlockers”) and those who float on the sea (“damplings”), loneliness has become a way of life for North and Callanish, until a sudden storm offshore brings change to both their lives–offering them a new understanding of the world they live in and the consequences of the past, while restoring hope in an unexpected future. 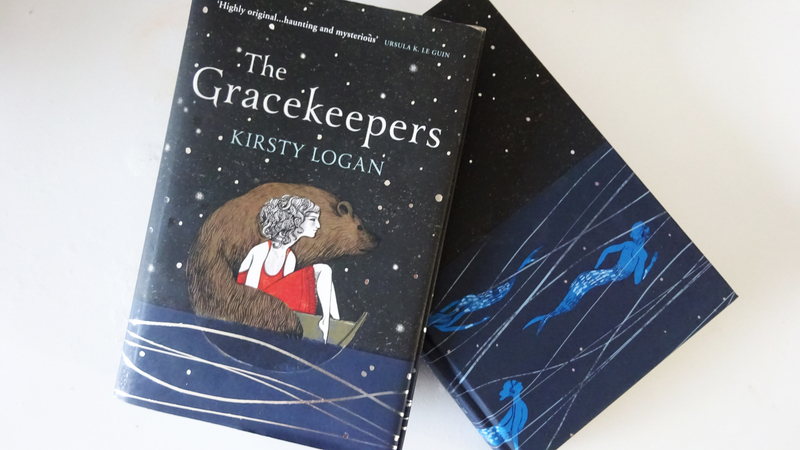 Inspired in part by Scottish myths and fairytales, The Gracekeepers tells a modern story of an irreparably changed world: one that harbors the same isolation and sadness, but also joys and marvels of our own age. The Gracekeepers is set in a post-apocalyptic world which is mostly covered in water. Those who live at sea are called damplings, and it is the landlockers who reside on the expensive but sparse islands that are dotted around what’s left of the planet. The mixing of damplings and landlockers is simply unheard of, other than those times when they must trade or entertain to survive, so the meeting of our two heroines is unlikely – until it happens, and their lives change forever. 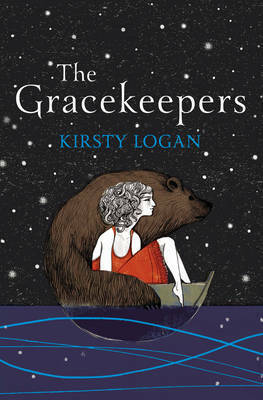 Through the burdened Gracekeeper Callanish, she who buries the dampling deceased, and North, a girl with a bear and a growing secret who travels from island to island with a floating circus, we come to know of love, loss, and life in this new world. North and her circus family must wear bells on their ankles when on the islands, Callanish is far away from her home island in the Graceyards, surrounded by water. North and Callanish’s lives must undergo drastic changes, for one those changes are thrust upon her, for the other she must choose for herself. 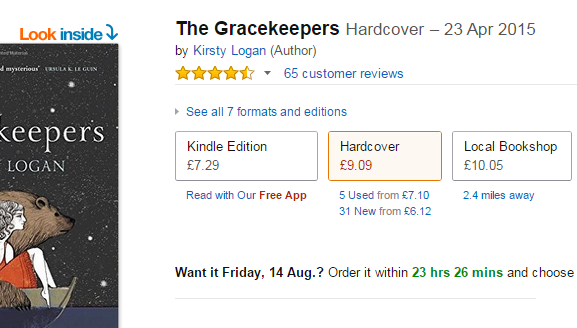 The Gracekeepers is narrated by interchanging characters with each chapter. While it is mostly told by our two heroines, Callanish and North, we also get the perspectives of supporting characters – I found this to give a greater insight into the world and story Logan has created, as well as the two main characters from outside of their own viewpoints. While I can’t say that had the novel been told only from the two points of view it wouldn’t have worked, I did feel as though it kept the narration exciting. It was a great choice by Kirsty Logan, her mastery of those voices is impeccable. I’d be happy to read more from this world, even without North and Callanish, if it meant characters like Red Gold, Flitch, and Melia were telling us about their little big lives. The characters in this book are just sublime. The names are interesting and memorable enough, but they themselves are open and raw enough to make you fall in love with them very quickly. Most of them, at least. I’ve never felt so connected to characters in a book before as I did with Callanish and North, not so intensely or so quickly. I could gush all day, really. The Gracekeepers is quite melancholy in a slow, mournful way, while at the same time being beautifully uplifting, and heart-opening. I will admit that it was kind of slow paced, the only thing compelling me to pick it up was how beautiful the writing was, not an urgency to find out what happens next. That’s not necessarily a bad thing, I just ended up enjoying it slower than I expected to. Had this book been rushed it would have ruined it completely. This is the kind of book that inspires you to write, while also making you want to give up, because you worry you’ll never write anything that comes even close to this. It’s also bloody beautiful, physically as well as lyrically that is. I wish my photographs could do it justice. The UK hardcover is flawless. On the 10th of August, Kirsty’s new book A Portable Shelter was published in hardback by The Association for Scottish Literary Studies, limited to 1000 copies. I pre-ordered a copy and it has arrived (albeit, a day late) so look out for that review some time soon. It will be published in paperback by Vintage in due course, so if you haven’t managed to nab one of the hardbacks you will be still be able to read it, and I’m sure the paperback will be beautiful because come on, it’s Vintage. My personal rating: 5/5. Amazon average: 4.3/5. Goodreads average: 3.67/5. Publication Date: April 23rd 2015. I sped through Annihilation recently and wanted to share some quick thoughts about this first book in a really exciting sci-fi trilogy. 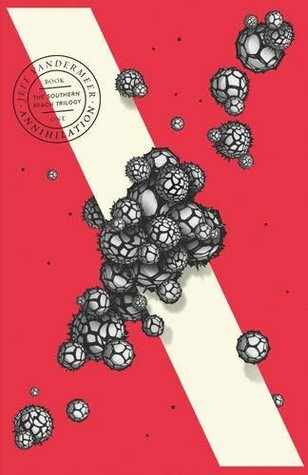 Annihilation is the first book in the Southern Reach trilogy by Jeff VanderMeer. It follows four women, identified only by their job titles/roles (biologist, psychologist, anthropologist, surveyor), into a barely chartered territory – Area X. 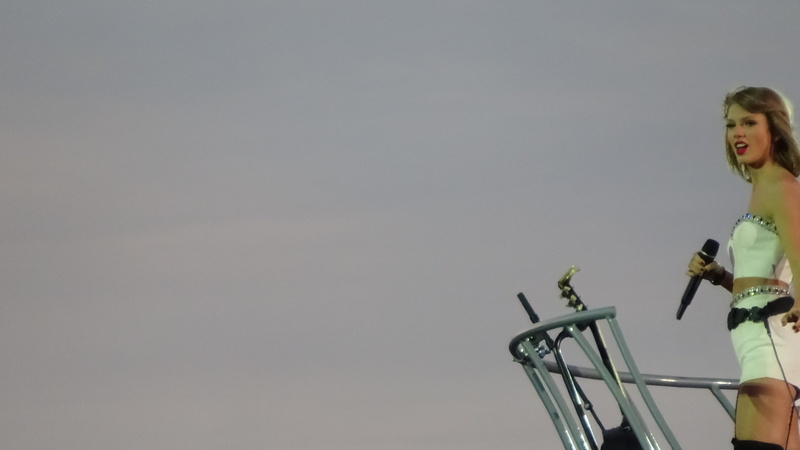 Over the past thirty years there have been multiple expeditions into Area X to try and find out exactly what happened to this land, what threat it poses to the rest of the world, and if anything can be done about it. After the failure of all previous expeditions this one, the twelfth, is narrated by the biologist who tells of the strange occurrences they encounter. Not all is as it seems though, and the biologist begins to wonder if their training was enough to prepare them for such a perilous mission. I first heard of these books when I saw the UK publisher, 4th Estate, posting pictures of the new paperback covers. They’re gorgeous, they caught my eye, and had me utterly intrigued. After reading the blurb of Annihilation I tucked the desire to read them into the back of my mind until a couple of weeks later when I saw them turned out at my local indie bookshop, Pritchards. I picked the first up, remembering that I’d thought it sounded interesting, and stuck it on my TBR shelf. I’m so glad I bumped it up my agenda and decided to read it quite quickly. It’s a swift read, I rushed through it in two short sittings, and found it extremely enjoyable, if not a little creepy and unsettling. I know I’m not an expert when it comes to the genre, but I’m certain that this is sci-fi at its best, its most compelling, and most accessible. VanderMeer’s wilderness descriptions are beautiful, eerily so when paired with a terrifying story line. It mixes psychological thriller elements with nature writing so seamlessly but I was quite shocked I enjoyed such a mix. With a lot of scientific jargon thrown in there too, I can understand if some readers don’t find it as interesting as I did, but I think the juxtaposition of objective observation with delicate depictions of nature created a nice balance. The narrating biologist is rather focused on her research yet divulges emotional insights, history, and motivations throughout the book, so this parallels quite nicely between character and setting. A lot happens in such a short book, which made me feel quite on edge and tense while reading it. Thankfully, the tenseness only lasted for the 195 pages, otherwise I think I’d have needed a massage when I finished! The second book in the series, Authority, follows what happens immediately after the twelfth expedition into Area X back in the command centre of the government facility in charge of the whole operation. I just started reading it today and can’t wait to report back on that one too. My personal rating: 4/5. Amazon average: 3.9/5. Goodreads average: 3.62/5. 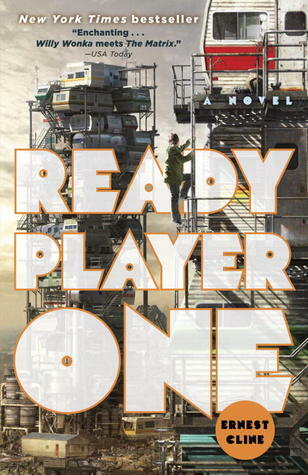 Recently, my friend Bri and I realised that we were both reading Ready Player One by Ernest Cline! She was listening to the audiobook, and I had been meaning to read it for a while. I bought a copy for my sister’s boyfriend last Christmas, but then he didn’t pick it up once. Finally, after seeing that Ernest Cline had written another book, Armada, I thought I’d finally read it myself. 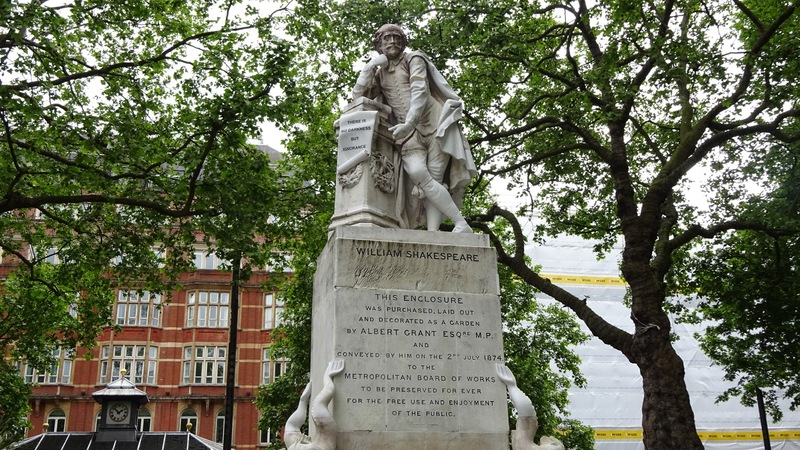 As Bri also has a book blog (a much better looked after one than mine, it is fantastic), we thought it would be nice to have a conversation about this book together, and cross-post it to both of our blogs. It’s quite unspoilery and I think it’d be interesting to read whether you’ve read this book or not. I n the year 2044, reality is an ugly place. The only time teenage Wade Watts really feels alive is when he’s jacked into the virtual utopia known as the OASIS. Wade’s devoted his life to studying the puzzles hidden within this world’s digital confines, puzzles that are based on their creator’s obsession with the pop culture of decades past and that promise massive power and fortune to whoever can unlock them. When Wade stumbles upon the first clue, he finds himself beset by players willing to kill to take this ultimate prize. The race is on, and if Wade’s going to survive, he’ll have to win—and confront the real world he’s always been so desperate to escape. Usually I post reviews in order to tell you my thoughts about a book, and whether or not I think you should read it and why. 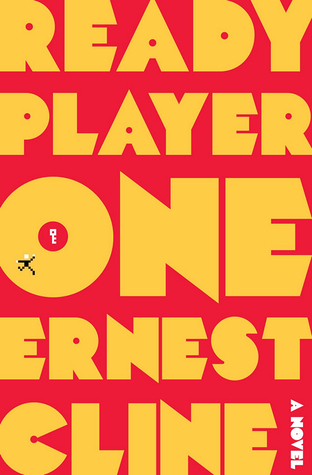 It’s pretty obvious that if you’ve not read Ready Player One yet that you definitely should do… so here’s what we thought when we read it. Bri: While I always want to read Armada, I think I’m going to wait a few months to check it out so that I won’t be constantly comparing it to Ready Player One. Since Wil Wheaton also narrated that audiobook, I’ll probably choose to listen to this book too. Adventure Time’s adorably weird and wonderful post-apocalyptic world has captured the hearts of fans worldwide. 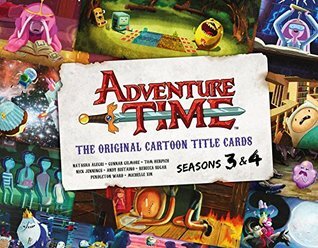 Featuring all the title cards from seasons 3 and 4 of the show, plus early sketches, creator commentary, and exclusive insights into the vast and varied inspirations behind the art, the second volume of Adventure Time: The Original Cartoon Title Cards is an absolute must-have for every fan. 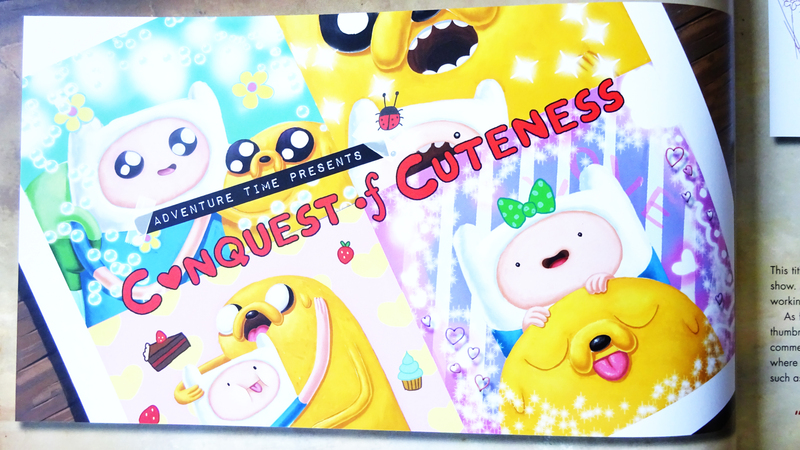 So back in September of 2014, Titan Books published the first volume of the Adventure Time Title Cards books. I saw it and was really looking forward to reading it, but unfortunately forgot to pick it up. Fast-forward to my birthday in February, and a friend of mine who seems to know me very well bought it for me as a present, and boy was I elated. Perfect gift. The first volume focuses on the first two seasons of the book, and the new one out today covers season three and four. 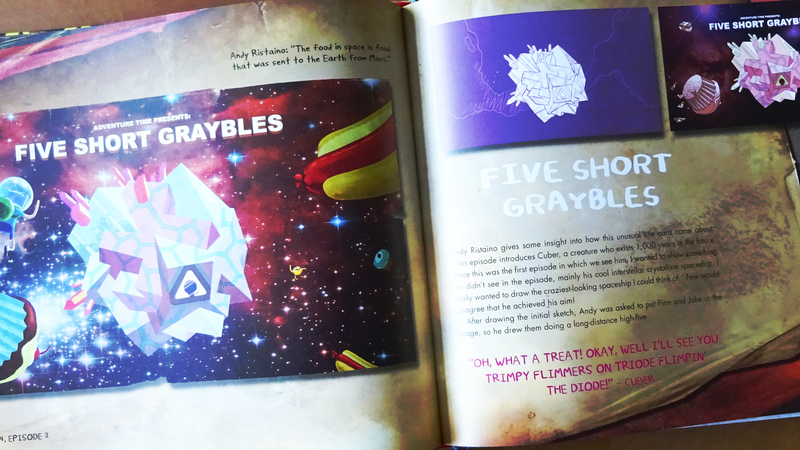 They follow the same format – two pages per episode, one page printed with the title card for each episode, the other with a sketch or early version of the title card, and an explanation of its design, as well as a strange out of context quote that only makes sense if you’ve seen the episode. Oh yes, sorry! I’ll rewind a little bit. So if you’ve not heard of Adventure Time yet, I’m not sure where you’ve been… Adventure Time is a ‘children’s’ cartoon, shown on Cartoon Network in the UK, which has been running since 2010. It’s about a young boy called Finn and his dog, Jake. It’s funny, endearing, original, and most definitely not just for children – adults all around the world have come to love it too. A bit like Disney, it’s fun for all ages. I’ve been watching Adventure Time for about four years or so now, and something which has always intrigued me has been the title cards. As the books explain in more detail, each episode is preceded by a hand painted ‘title card’, a glimpse of what’s to come in the episode, and they don’t stay on screen for very long so you may sometimes struggle to get a good look at them. These books remedy that, you have all the time in the world to enjoy the title cards for what they really are – another form of art, and another medium of telling the stories that Pendleton Ward and his team of writers spin in this show. They’re beautiful, sometimes haunting, and often stray from the very distinct, cheery, recognisable drawing style that Adventure Time usually uses. These books collect them all in one place for your perusal, quite handy! You can have a look at some of the season 3 & 4 title cards in this Buzzfeed article, but I’d suggest picking the book up so that you can flip through, enjoy the explanations, and see them all. These books have helped me re-live episodes I’ve not seen in a couple of years, and compelled me at times to go back and pick out my favourite ones to watch again. My niece, who watched it as a baby simply because the colours fascinated her, is getting to an age now where she might start to appreciate the story line too, and I’m itching to get back, so I’ll have to begin it all again and experience it once more, this time understanding the intentions behind the title cards at the beginning! To be honest, I was worried that the second volume, being in the same format as the first, would get a bit boring and samey. Why should you spend the extra money to read another one? Thankfully, my fears were assuaged when I realised that the second is just as interesting and insightful into the process of creating the title cards and the show as a whole. The humour is still there, and there’s also a sense of growing creativity. There are some new artists in seasons 3 & 4, and you can definitely see how they all brought something extra to the designs. Since reading the first volume thoroughly when I received it, I have flicked through and enjoyed it a few times since: the art is sublime and worth going back to again and again. I definitely expect to feel the same about volume 2, and the title cards of season 3 and 4. 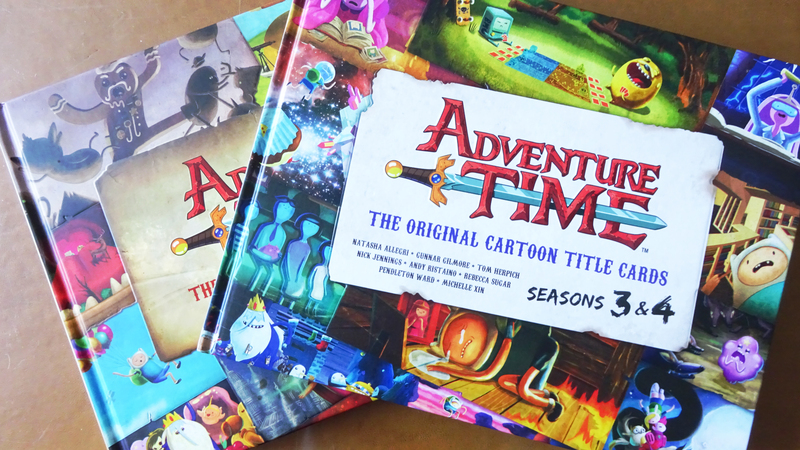 Both volumes of the Adventure Time Title Cards books are beautiful, the quality of the paper and printing makes it easy to justify the price, and make a nice addition to a collection. The thing about having interests like Adventure Time, something rather nerdy or geeky so to speak, is that it does take you back to feeling as excited as a child, while appreciating the art as an adult. As a child you want to collect everything to do with your favourite things, and this urge seems to have carried through to adulthood. There’s a massive amount of merchandise around for Adventure Time, from clothing, figures, Pop Vinyl, plushes, the comic series, and more, as well as handmade, non-official merchandise that’s always hanging around the internet. If you’re into collecting things and into Adventure Time, this is a no-brainer. Not only are they gorgeous, they enhance your enjoyment of the show. Who can say no? My verdict on this not so traditional book is: buy it if you are a fan, and if you’ve ever been curious about the title card. I’d also suggest it as a present for someone who loves the show, old or young. I received the first one as a gift and have benefited from this present many times over! I’d definitely recommend gifting them as a pair, and starting off their new collection. My personal rating: 5/5. It upholds the high standard I’ve come to expect from Adventure Time merchandise, and from Titan Books. It met all expectations and I don’t think I could have asked for anything more. Add it to your Goodreads shelves here! So are you an Adventure Time fan, or do you think you might like to watch it? 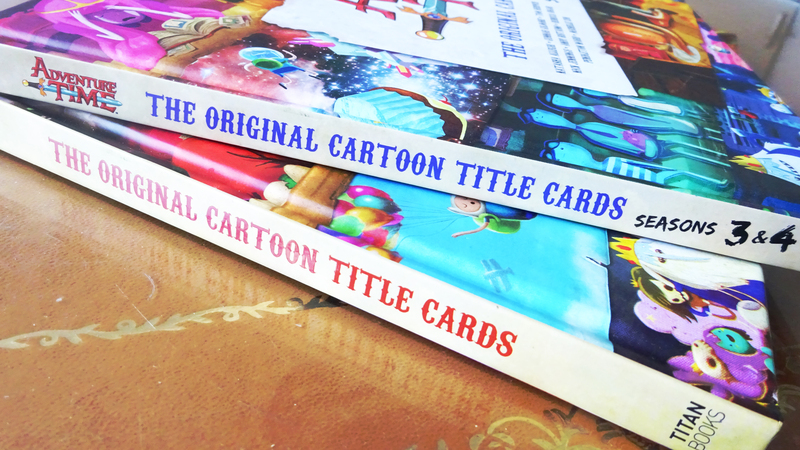 Have you read the first Title Card book or planning on picking these volumes up? Let me know in the comments below! It has been a while. Guess what I’ve been doing? Working, mostly. Other interesting things too, but working is most important! Last Friday I finished off three months at Penguin Random House, after two weeks of work experience at Transworld I was asked to stay on as a temp for another five weeks. Then I popped over to Cornerstone for another five weeks as they were a bit busy (understatement) and had some holidays coming up they needed cover for. Not going to lie… probably the best three months of my life. Also some of the busiest. Since then I’ve been looking after my niece, and have now just moved back to my mum’s in Liverpool – until I get a job! So yes, I haven’t managed to post on this blog, but I was doing the whole 9-5 thing (okay, longer than that, but in the most optional way! ), and then coming home and helping out with my niece, not to mention all of the reading I’ve been doing. 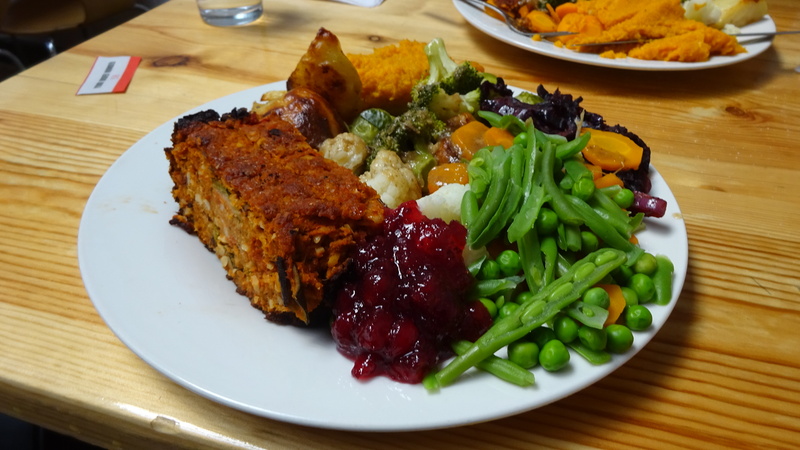 So I haven’t really reviewed anything in almost six weeks, but sometimes you’ve just got to let life happen, or make life happen, and forget that you have a blog for a while. Blogging as a hobby is supposed to be fun, and if I’d been worrying about keeping to another schedule I’d have probably gone a little insane. Now that my time has freed up, however, I’ll be reading and reviewing as much as I can. Other than working, and being the best auntie in the world, I’ve still managed to get up to a few things – some down to the dream job, and some while being an excellent aunt. For an unknown reason (laziness), none of these things include updating the blog. Sue me. Where in the world have I been, you ask?! London. Yeah, still London. With a bit of Liverpool. But it turns out there’s a hell of a lot to do there and I’ve taken advantage of that a little bit more than I usually do. Warning: picture heavy post about to commence! 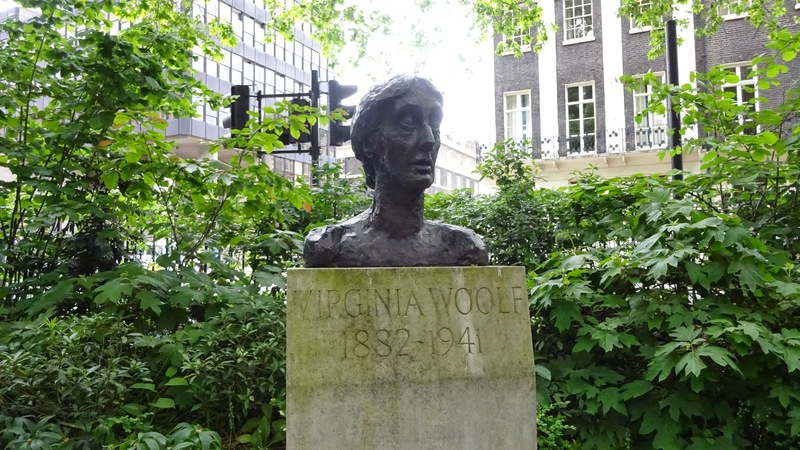 While at Transworld I got to take part in the Penguin Random House & DK charity Walk For Mind, around Literary London! I popped to a couple of talks at Greenwich Book Fair, walking there and back (about an hour each way) while listening to Yes Please! by Amy Poehler. A great book to listen to, I’m glad I chose to use an Audible credit on it. 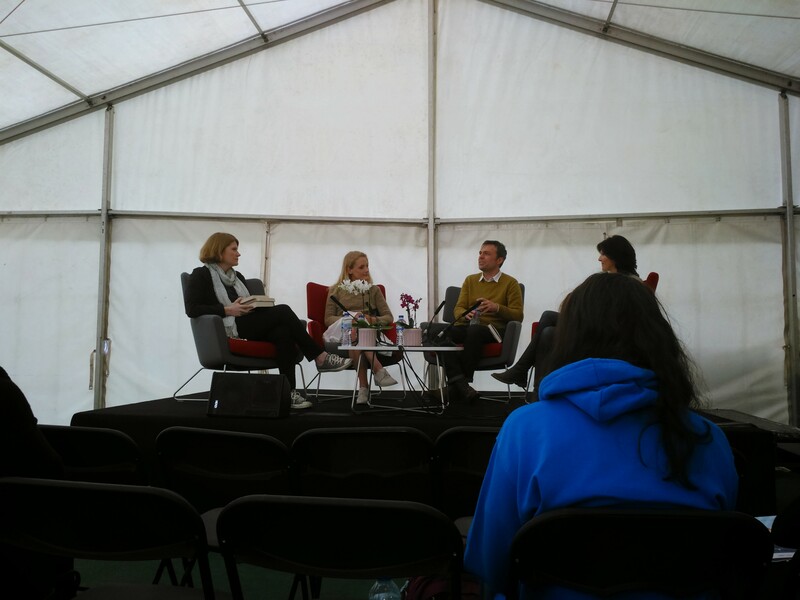 I went to the panel on emotions in fiction, chaired by Cathy Rentzenbrink (Bookseller Books Editor, write of The Last Act of Love), with panelists James Hannah (The A to Z of You and Me), Lucy Foley (The Book of Lost and Found), and Lindsay Hawdon (Jakob’s Colours). 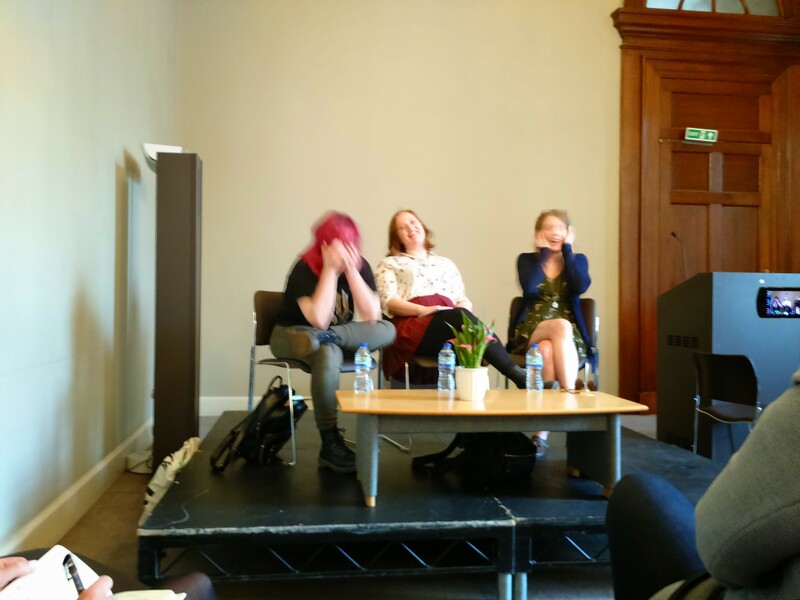 I also attended the panel about Booktube, with Sanne Vliegenthart (booksandquills), Leena Norms (justkissmyfrog), and Jen Campbell (writer, and booktuber). 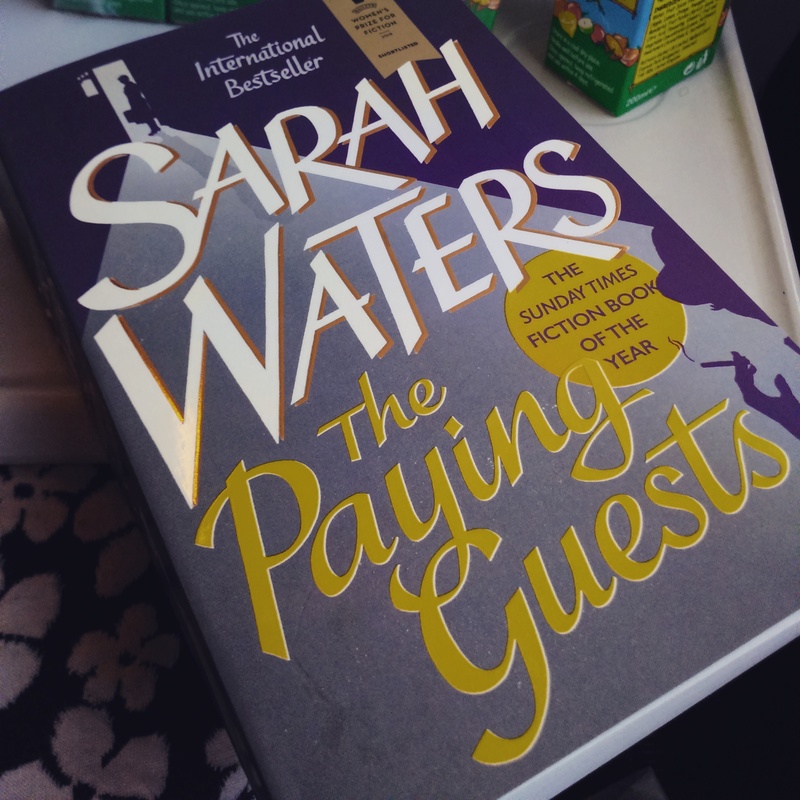 I read The Paying Guests, which won The Independent Bookshop Week Award. 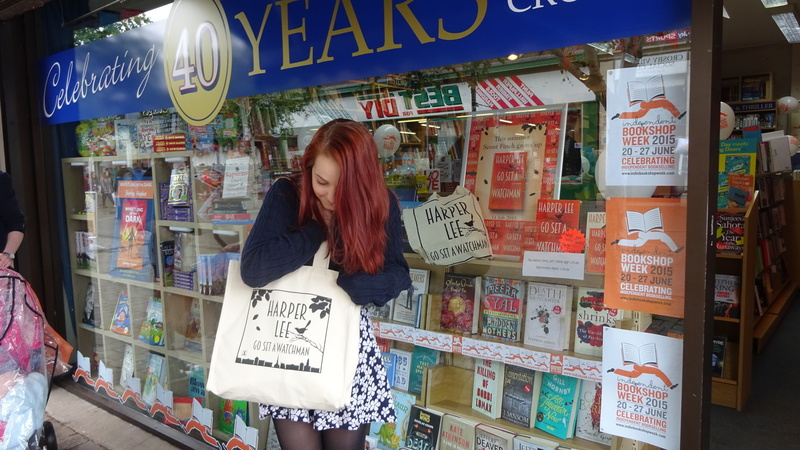 And then of course, I got involved with IBW in the best way possible – by visiting Indie Bookshops and buying as many books as I could afford! 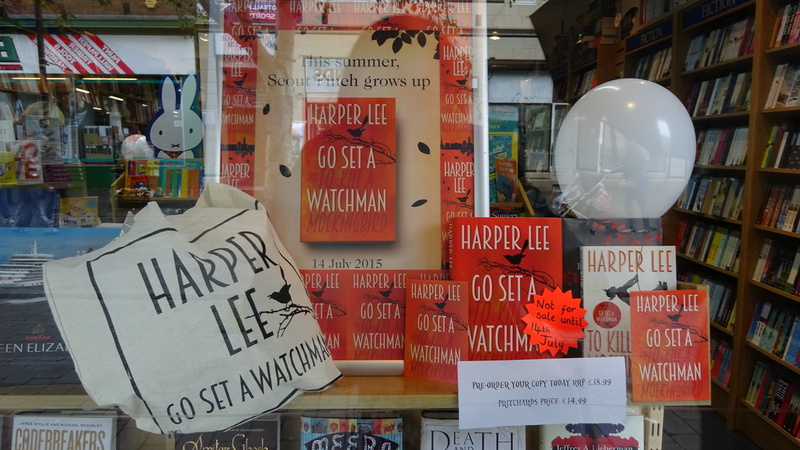 I popped to my local indie back home, Pritchards, to pre-order Go Set a Watchman on the 20th of June. 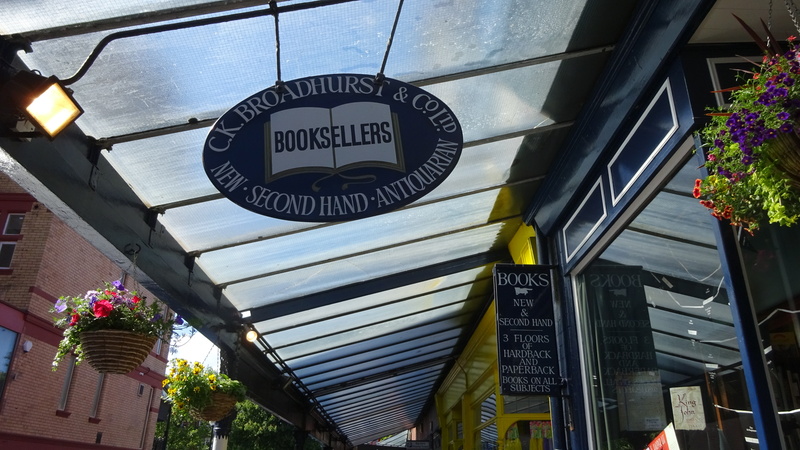 Then Broadhursts in Southport, to pick up a book for me and a birthday present for my sister. 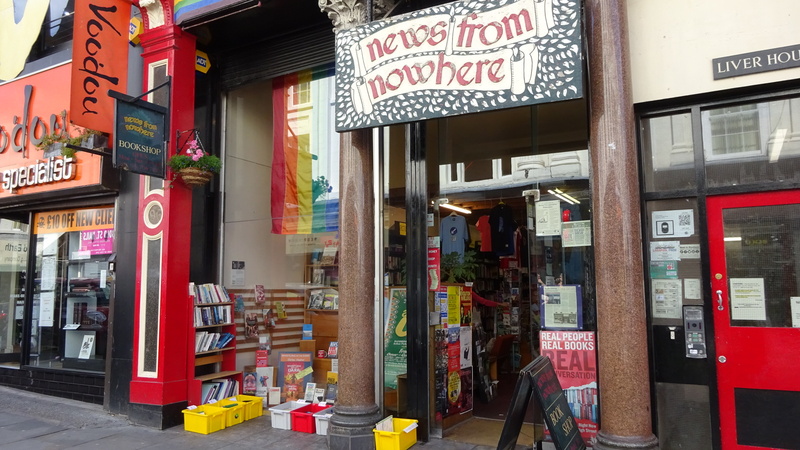 Then News from Nowhere in Liverpool on the Sunday, to buy a vegan cookbook for my sister. 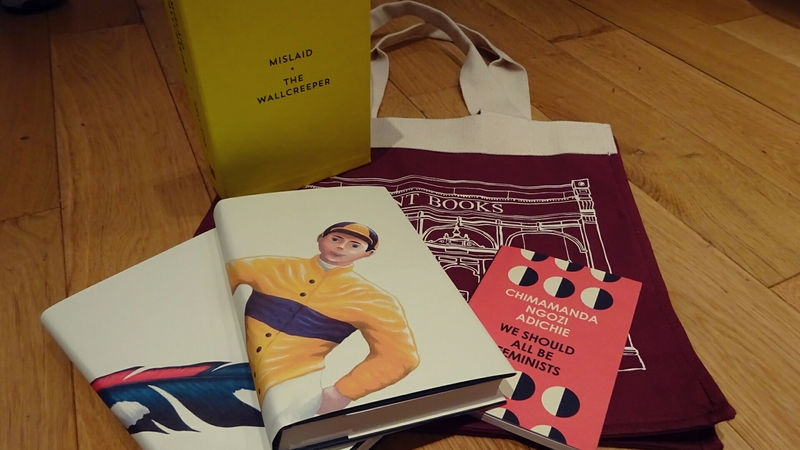 I met my lovely friend Vic at Daunt Books on the Monday and splashed out on some things for me – Nell Zink’s Misland and The Wallcreeper, Chimamanda Ngozi Adichie’s Ted Talk ‘We Should All Be Feminists’, in print. And of course a Daunt bag, which I haven’t stopped using since. Then the lovely Books Are My Bag team sent me a book bundle for getting involved on Twitter! While everyone else was enjoying the actual IBW book crawl on Saturday 27th, I was celebrating my sister’s birthday in the best possible way. At a Taylor Swift show. 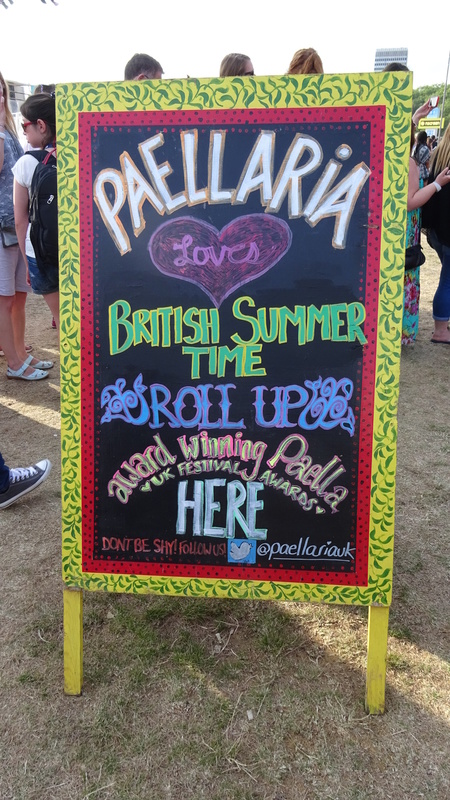 Specifically, British Summer Time in Hyde Park. It was one of the best nights of my life. She’s an angel. It was quite hard to find any food (why would they need three popcorn stands, but nowhere for veggies? Really?) 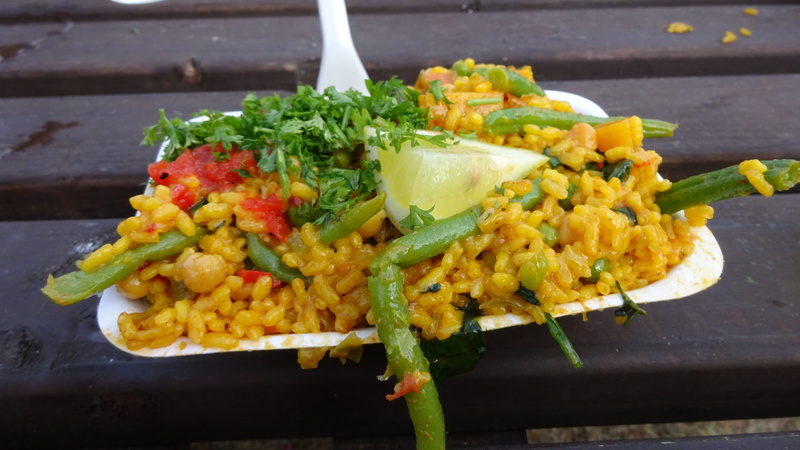 but eventually we found this lovely paella stand who had a categorically vegan option. It was delicious as well as filling. Win win. 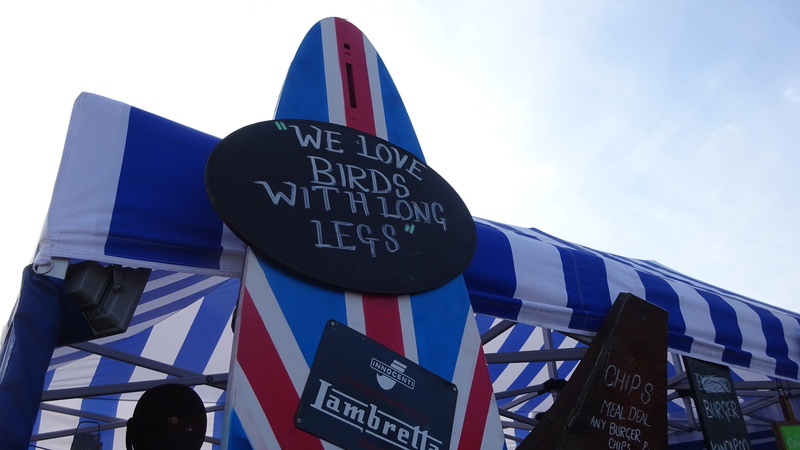 Then there was this stupidly misogynistic ostrich pun at an ostrich burger stall, which made me get all militant on Twitter, shouting at Barclaycard, BST, and tagging Taylor in case she was interested (she wasn’t). After that, I had my final week at Cornerstone. Needless to say, it was fantastic, I got to do some really great work, and I was rather sad to leave. The publicity team there are amazing, simply put. 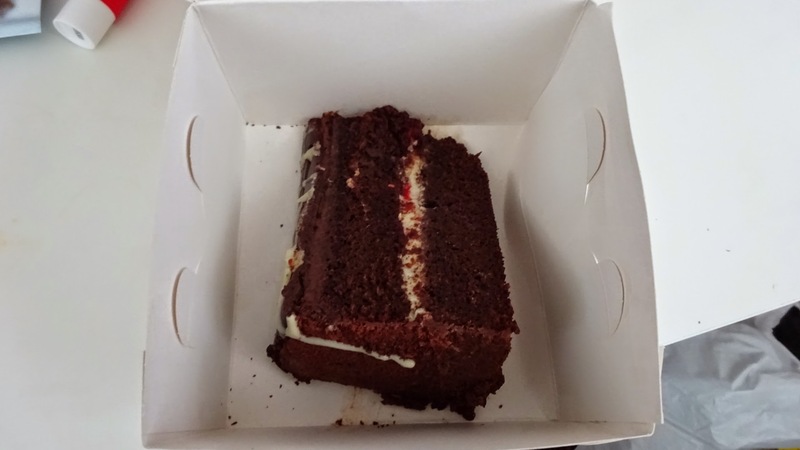 They embraced me as one of their own while I was there, and seemed just as upset to lose me as I was to lose them – they got me some lovely cards, a vegan cupcake from Lola’s, and then sent on a Waterstones giftcard because apparently it is obvious how much I love to read. Amazing people. It has been a week and I’m still missing them! After spending last Friday evening being incredibly social and setting up my sister’s Goodreads account, I thought I’d better do something a bit more outside-the-flat on Saturday. I popped into the city to meet up with the bestie for a little bit. We wandered around (Waterstones, Trafalgar Square, and Foyles, Charing Cross Road, because to me, wandering = bookshops), ate Chipotle (still not as good as Barburrito, but better than Tortilla, Benito’s Hat, and Mi Casa, in case you were wondering), and ended up spontaneously going to Top Secret Comedy Club then dancing the night away in Camden Barfly. Excellent! Last Sunday was a day of looking after my niece, so we watched Charlotte’s Web (one of us cried, not saying who), waited in all day for a package for my sister, and then went to the park! I don’t have any photos because it’s difficult to play football, chase after an escaping 20-month-old, keep an eye on a pram that you’ve just had to run really far away from, and whip your camera out all at the same time. Trust me when I say we looked adorable though, and everyone else was jealous of all of the fun we were having. And all of the steps my Fitbit was counting. (Yes I won the weekend warrior challenge, thanks for asking). On Tuesday I popped back into the city to go for Thai food with friends (it’s hard being vegan and going out for Thai food, but not impossible). On Thursday I got to see Bridget Christie and Rhys James at the Laugh Out London festival in Islington, both doing their Edinburgh Fringe previews. I had just finished A Book For Her by Bridget Christie, which I would more than recommend – it is fantastic, she totally gets feminism and its intersections, without alienating her audience. She makes feminism funny, by laughing at the oppressions women face without laughing at the victims of them. It is brilliant. Her show was similarly so, if a little rough around the edges – but that’s exactly what you expect from a preview – it was actually quite endearing to see the process of putting together a stand-up show, especially after reading about her journey to becoming the ‘feminist comedian’ in her book. Rhys James was also really funny! He’s that guy on Twitter that I followed for ages because he said quite hilarious things – turns out he’s loads good in real life too. There were a couple of jokes I was crying at straight away that took the rest of the audience a little while to catch up to. Excellent stuff. If you’re in Edinburgh for Fringe, do go and see both of them. I moved back home yesterday, Saturday 11th, and basically went straight to sleep, before waking up and finishing Ready Player One, a book I bought my sister’s boyfriend for Christmas – but he hasn’t yet read it, and probably never will, so I finally picked it up and read it. Ernie Cline’s Armada is due out next week, so that’s something to look forward to! I spent a good few hours of today with my nan, and I’ll be seeing her again tomorrow morning as it’s her 81st birthday! Then off to town to spend my Waterstones gift card (haul post incoming!). Tuesday is Go Set a Watchman day! Then who knows? Jobhunting. Probably jobhunting. Well done to anyone who got this far! What have I been missing in the book blogging world? Please link me to any interesting posts or reviews on your blog so I can catch up!